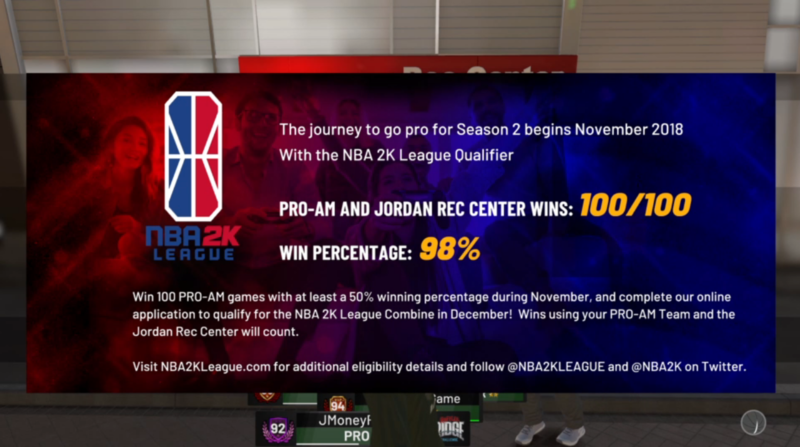 NBA 2K player AboutTheGame hit 100 combined wins in Pro-Am/Rec Center, becoming the first player to qualify for the NBA 2K League season two combine. Amazingly, AboutTheGame was also the first player to qualify for the inaugural NBA 2K League combine early in 2018. He recorded 50 wins in Pro-Am extremely quickly, hitting the then-baseline requirement in around 24 hours. This time around, it took AboutTheGame a little over three days to notch 100 wins while maintaining a winning percentage over 50%. He’ll still have to cement his place in the combine by completing the NBA 2K League combine application, still unreleased, but he’s nonetheless the first player past the finish line. DIMER: How many hours did qualifying take you? AboutTheGame: I’m not too sure, I would assume around 50-60 hours. DIMER: Will you keep playing Pro-Am or do you plan to take a break until the combine? AboutTheGame: Yeah, I’ll be down to play Pro-Am if teams are matching up. DIMER: What was your method for grinding out the wins? AboutTheGame: There wasn’t really any method to it besides for trying to beat teams so badly that they quit [expediting the process]. DIMER: Did you play solo or with friends? AboutTheGame: I played with friends. That would be my advice to anyone still playing. It helps to speed up the slow pace of the games with some conversation. The full qualifier requirements can be found here. Here are a few tips for qualifying for the combine.